The Maxi-Therm Ultimate Package is the perfect turn-key solution for your heating hot water (or water/glycol solution) needs. The idea is to fit on the smallest possible footprint all the essential components required for any steam to hot water heater closed loop. Each system is carefully engineered to meet the specific technical requirements of your project. We have installations for liquid flow between 35 and 850 usgpm and we can go above 2,000 usgpm (per heat exchanger). The Maxi-Therm steam water heater system uses a control valve on the condensate side for temperature control on a vertical heat exchanger. This difference allows two advantages. First, high pressure steam can be used. A pressure reducing station is not needed, and steam piping is smaller and lighter. Second, the heater utilizes the latent and sensible heat of the steam. 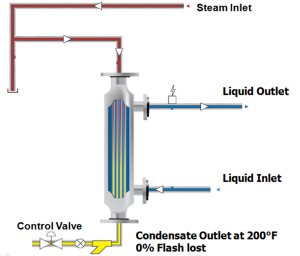 It subcools the condensate to 200F or below so flash steam losses are eliminated.